The civil injunctions are designed “to break gang culture” by banning individuals from wearing their gang’s colours, entering rival territory and even walking aggressive dogs. They will also be used to force members to take part in mentoring programmes. But critics of the scheme warn young people could be considered “guilty by association”. The Asbo-style powers were conceived by the previous Labour government in response to appeals from local councils for help in combating gang culture. The new behaviour orders are designed to tackle a “higher level of criminality” but will not replace the prosecution of gang members who have committed violent crimes. Deputy Assistant Commissioner Sue Akers, the authority on gangs for the Association of Chief Police Officers, praised the new powers for offering “another option” when tackling gang issues. Crime Prevention Minister James Brokenshire said: “Gangs cause significant and lasting harm to our communities through fuelling violence, creating an atmosphere of fear and drawing young people into criminality. 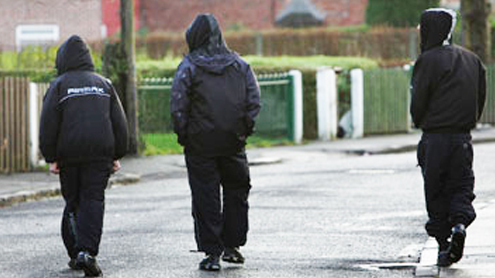 “These new powers will help police and local authorities tackle local gang problems by placing tough conditions on the behaviour of individuals involved in gang-related violence and providing strong support to those who want to leave violent gangs.” Other measures targeted at 14 to 17-year-olds involved in gang activity are due to be trialled later in the year.